Well! I don’t know how on earth a year has passed since I became the ShockSoc vice president but its come to the end of my (not so) tyrannical (laid back) reign over the year long project and the fruit of mine, Justin’s and Richard’s loins has finally been brought to life! 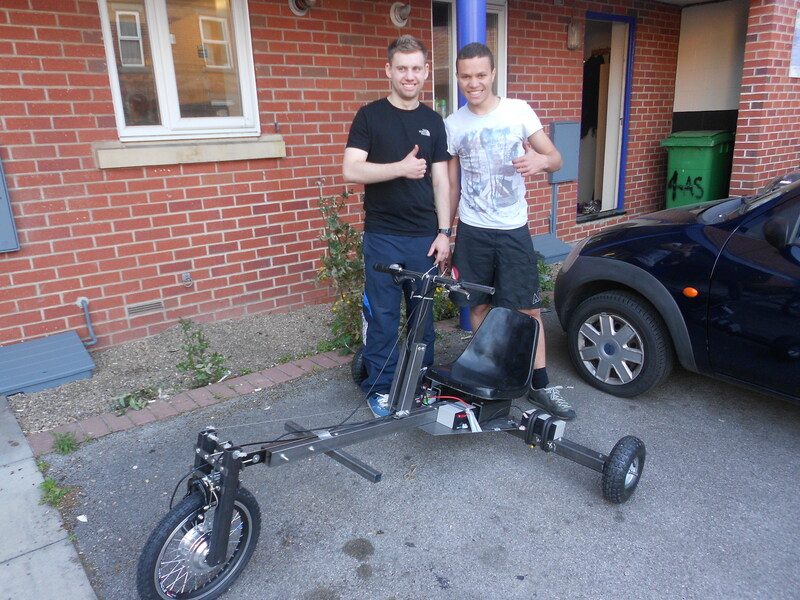 Today, Justin and I completed the ShockSoc trike with a hand drill, hacksaw and my back garden area. It completely brings back memories of the excitement I felt back when I first built my own trike and being able to get funding, along with actually completing the project just adds to the brilliance! There are a few dodgy parts but nothing that really stopped us from being able to drive it. Obviously, to anybody who has ever built their own EVs, how fast does it go you ask?! Fortunately, in this day and age, GPS on mobile phones is of exceptional quality and the wealth of free GPS speed measuring software (including Google’s own, MyTracks), measuring your speed accurately over a distance is really easy. SO! How fast does it go?! The magic number is: 13.83mph… It might seem slow but considering the whole body is made out of mild steel (excluding tyres and the seat, of course) and sealed lead acid batteries, it is surprisingly fast. That was measured with me driving as I’m pretty lightweight myself anyway, along one of the relatively flat roads near my house. Now for the excuses… I didn’t feel like I was actually going at top speed, I was still slowly accelerating though a 90deg corner was up ahead so I started to slow down. The batteries weren’t actually fully charged, they’d been sat in the university laboratory for the past few months in a partially charged state, along with the fact that Justin, Richard, myself and Kim had all already had a go driving it up and down the street! Yep, that is me and Justin! I think it has a really cool “punky” feel to it, the solid steel and tensioned cable steering mechanism just makes it so much more fun, not forgetting the fact that you fear for your life while driving it! It has a few problems with it but those taking over next years committee can deal with those, if of course they wish to continue this as their project. What would be really fun, would be designing another trike but with three wheel drive though the price of that, I’m sure would exceed anything we could ever get for ShockSoc, never mind synchronising the speed of each wheel. This project has however proven that you can design, build and test an electric vehicle on a <£400 budget WITHOUT the use of a welder (we could’ve done it much cheaper if we actually had the opportunity to use a welder). And the university will always be able to say that this project was completely entirely by undergraduate students (predominantly 3 of us…) with all of us still in studies. Regardless, next year will consist of a new committee and as with the cycle of life, the majority of the current committee that I am involved with will be moving on to other ventures! I’m both proud and happy that I was voted in as vice president and I certainly hope I fulfilled my role!